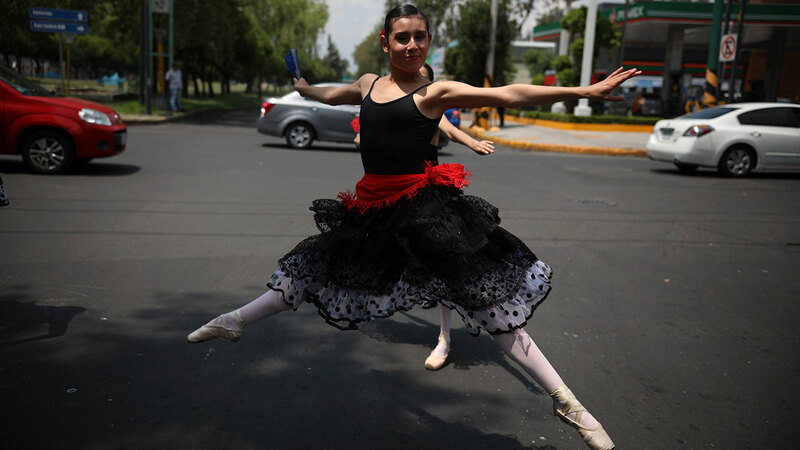 MEXICO CITY (AP) -- Remedios Rosas was walking down a Mexico City street Saturday when she saw seven tutu-clad dancers tiptoe to the sidewalk, their chins held high, and join pedestrians waiting to cross the road. When the light changed, music started and the dancers leaped into the street, twirling and twisting in front of surprised drivers. The 58-second show - the duration of a Mexico City traffic light - is part of a theater company's attempt to brighten the days of motorists at snarled intersections in this sprawling megalopolis notorious for its clogged roadways. The idea of the performances was inspired by photographer Oscar Rodriguez, who captured portraits of the dancers in the streets. Now, the performances are part of an initiative called "the theatricality of public space." The theater company is called Ardentia.